TDS – 3 Pocket Meter. 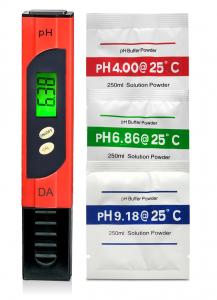 Digital Aid Professional pH Meter with Large Backlit LCD Screen. Range 0.00 to 14.0 pH. Free pH Buffer Solution Powders Included. Lifetime Guarantee on this Accurate and Reliable pH Test Meter. Get Free pH Buffer Solution Powder – pH 4.00, 6.86 & 9.18 Included. FREE pH Chart emailed with each order! Professional Quality, Bright Backlit LCD Screen. Unlike Economy models available. If you are looking for a Super Accurate and Reliable Meter, this is the one for You! pH tells you when you need to add Chlorine to your pool… or when your wine or cheese is ready! Last pH Meter you’ll have to buy, we’re so confident we offer a 100% Money Back Guarantee for Life! Water purification applications, waste-water regulation, aquaculture, hydroponics, labs & scientific testing, pools & spas, ecology testing, wine making, agriculture and much more. • Get Free powders to make 4.00, 6.86, and 9.18 pH buffer solutions – see coupon above. We know you will love this pH Water Testing Meter. © Copyright 2013-2017 Loretta Green LLC. Brand:- Digital Aid. All Rights Reserved.